M.J. Soffe is a leading manufacturer of sports and military apparel. 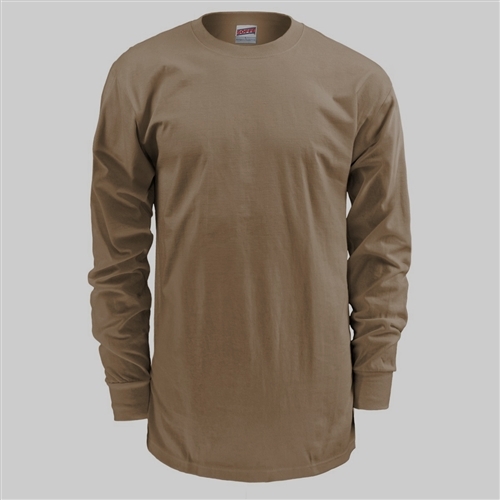 The Soffe M290-3 Tan 499 Long Sleeve T-Shirt is the approved shade for wear with Scorpion II OCP, and Multicam OEF-CP Army Combat Uniforms. Made of with a preshrunk lightweight 50% Ringspun Cotton/ 50% Polyester jersey knit. The cloth weighs 4 oz per yard. Finish features included a double-needle stitching at the shoulders and a no-roll, high-density rib knit crew collar that won't sag. 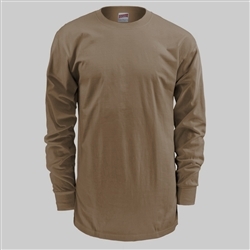 This is a comfortable undershirt for uniform and all wear.